Ceremonial blend from the south of India that was used before all initiation ceremonies for priests and keepers of ancient secret remedies. This blend combines the power of sweet scented flowers with magical herbs to help the brain release endorphins so that a calm meditative state can be experienced, when inhaling the vapors. 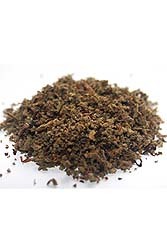 Also sold as an Herbal Smoke Blend called South Indian Burning Incense and Smoke Blend. Ingredients: Pure shade dried herbs and herbal oils of Blue and white Lotus petals, Jasmine flowers, cedar, myrrh, acacia, artemesia, Scull cap, Chamomile, Davana, Mullein, Calamus ,Catnip, alpine lavender, Passionflower, Wormwood and a proprietary incense blend from a South Indian temple priest.